Comprising a surface area of more than 700 sqkm, the Karwendel Alpine Park is the largest nature park of Austria. The 2,243 m high Hundskopf mountain in the Karwendel mountain chain. Panoramic view to the Freiung Spitze peak. The Sonnjoch saddle (2,457 m asl) is a well-known hiking destination. Exploring the Karwendel Alpine Park on the Goetheweg path. Also the Lamsenjochkapelle chapel can be found in the nature park. Larch trees in the surroundings of the Magdeburger Hütte refuge. The wild water system of the Isar river is unique. The Risstal valley in the Karwendel Alpine Park. The “Ahornboden” is characterised by the most impressive sycamore forest of Europe. Breathtaking! The Sylvensteinspeicher is an artificial lake. The Karwendel Alpine Park in winter months. The area of the Karwendel Alpine Park is characterised by wild rivers and primeval forests, comprising almost the entire Karwendel mountain chain and so also the area from Innsbruck to Lake Achensee. The area round the Karwendel mountain massif harkens back on a 150-year long history in alpinism. Today, however, hunting as well as forestry have an important role to play. The nature park comprises a total of 11 protected areas, that can be experienced in special hikes and tours. Counted among are also several protected landscapes, so to speak areas in which the cultural landscape predominates, as well as some natural conservation areas and quiet zones. Probably the most famous of these areas is the nature reserve of the Karwendel, embedded in the heart of the Karwendel Alpine Park. Another highlight of the nature park is the so-called “Ahornboden” in the rear Risstal valley, which is characterised by the most impressive sycamore forest of Europe, a particularly popular photo motif. Sycamores have existed in Europe since the Ice Age, pollution, however, has pressed this tree species very hard. At the “Ahornboden”, this forest has found a protected ground, which is unique. The Karwendel Alpine Park is a “Natura2000″ area, that is a network of protected areas within Europe. Animals and plants, that can still be observed right here, are the Alpine newt, the common sandpiper and the red deer as well as sycamores and the German tamarisk. 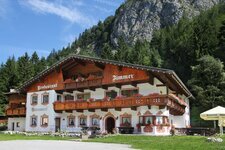 The two visitors’ centres provide useful information about the Karwendel Alpine Park: the visitor’s centre Hinterriss is an impressive museum focusing on the museum, and also Scharnitz offers a little centre that provides curiosities about the nature park.